Trade: Rocky Mtn Oysters | Who’s Your Haddy? Andrew’s thoughts: Haddy swinging this deal from court is ironic since I think he should be put on trial for robbery. Hey-ooooooo! I traded $6 and one of the 4ths in this deal for the 24th overall pick. So for some reason Dusty’s paying basically the same price for picks two full rounds later. Whatever, I guess. Feels like an overcorrection to having a ton of auction budget and no draft picks. Aren’t Will Benson and Joey Wentz the type of guys you can wait and find on waivers later? Meh. Maybe they’re awesome and I have no clue what I’m talking about. Better hope they sprout trade value by July. Jordan’s thoughts: The price of getting on the draft clock seems to be roughly $5. This is for back to back picks. Cool I guess. Jordan’s thoughts: Well when you get Francisco Lindor, clearly you don’t need Brandon Crawford anymore. So you give him away. Hernandez has some value from being a strong backup at three positions. Do not confuse him with actually being good. Paulsen is fine, he hits in Coors. Double Stuff win themselves a likely top ten short stop candidate, even in a field that has risen to the occasion. If Crawford ends up just being top 16, they ended up paying two bench pieces for a starting player. It’s a winning deal. I doubt any of these players have any long term value. Andrew’s thoughts: I like this one for the Double Stuffs. As Jordan said above, two utility bench players is worth it for a starter. I don’t like Crawford much at all, but for $14, he’s more valuable to a roster than Hernandez or Paulsen. This is sort of a weird follow up to Dusty’s other deal. He basically bought someone here (Paulsen) who plays the same spots as Hanley Ramirez but not nearly as well, so he acquired someone his previous deal made superfluous, and downgraded his back-up to Francisco Lindor from Crawford to Hernandez. Jordan’s thoughts: Deals like this just do not seem to happen very often. HLR dealt with the news of Swihart being sent down to the minors by shipping him off to another team. He replaces his backup catcher with a guy who in pre-season was projected to be a borderline fantasy starter. There is no real reason to love Realmuto. There is no real reason to dislike him. He’s an everyday catcher who does okay. Swihart in 6 games this year went 5/18 with no extra base hits, but did add 4 walks. Getting sent down does not help Swihart’s case for future stardom. In the draft both of these catchers were likely overpays, and both do not appear keep-able in any real sense. With that said, does Swihart now being green flagged, does that change anything? RMO can probably afford to drop their 15th prospect and cross their fingers. Perhaps Swihart comes back and has a great finish to this 2016 campaign. But its a two edged sword. He’s $14 going on $16 to keep. If he gets ridiculously hot, he’s a easy target for greed dollars. $16 would put him in to top 7 for paid catchers. There is just likely better options, and while HLR did not get much in return for him, I do not think he lost anything either. Andrew’s thoughts: This is sort of like trading two nickels for a dime. In the immediate sense, Realmuto’s clearly more valuable. He plays for a major league team, while Swihart… who knows. There are rumors he’ll be demoted, lose playing time, switch positions. It’s just a mess. That’s the thing about young catchers. They almost all develop their defensive game first, then work on their hitting. So they rarely hit the majors capable of hanging with big league pitching. It takes a while before these guys do anything fantasy relevant. That development is part of the reason Swihart is getting sent back down — except it’s the opposite for him. His defense and game calling needs work. So basically, his offensive game thus far is at least somewhat indicative of what he is. And that is serviceable but mostly meh. His offensive production is fine for a catcher, but if he becomes an OF or 1B, he’s instantly worth next to nothing. Obviously his bat isn’t done developing either, but you get my drift. I agree with Jordan that neither of these guys have super attractive long-term prices and so yeah, give me Realmuto, who I can at least rely on today. 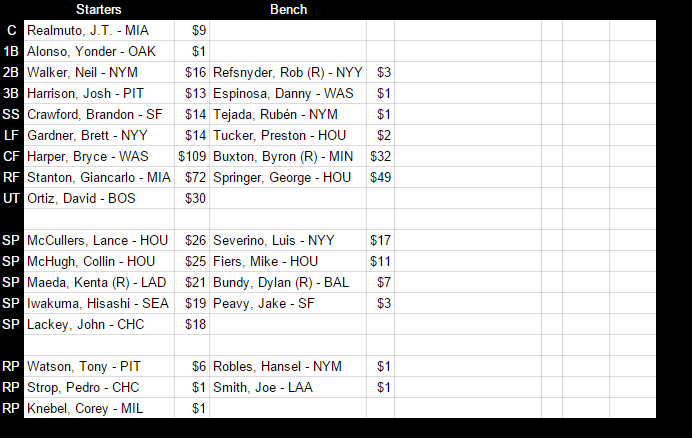 Derek Norris went for $5 and Francisco Cervelli went for $7, and those guys were top six catchers a year ago. So that you’re already paying more for Swihart and Realmuto, I just… I don’t know what you’re paying for? I suppose with Swihart more so than Realmuto, you want him because “upside,” but I’m also not sure what that ceiling really is. Unless it’s Buster Posey, it probably doesn’t matter at the catcher position. The gap between catchers is so slim that whether you’re the second best catcher or eighth best catcher is almost negligible. It’s a fair deal though. Or at least justifiable from both sides. There’s nothing wrong with it. Without an in-season cap you don’t have to do anything with Swihart until next season, but if he gets demoted, I’m not sure paying $16 next year is even an option at which point, why not just hold onto the 2016 contributor in Realmuto?